First editions of Shackleton’s fascinating account of the British Antarctic Expedition of 1907-1909. 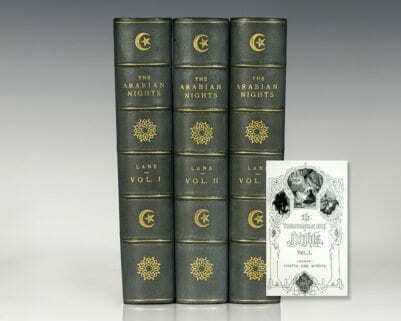 Large octavos, 2 volumes, original blue cloth, photogravure frontispiece to each volume, 12 captioned tissue-guarded colored, and 255 black and white other plates in all, 3 maps, panorama in end-pocket of volume II, and numerous illustrations and diagrams throughout. In very good condition. 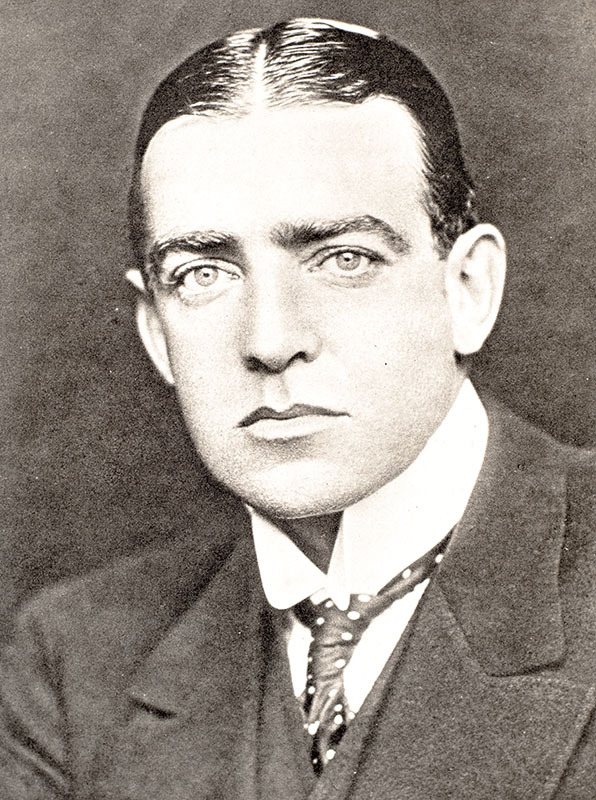 Ernest Shackleton here tells the quite remarkable story of the British Antarctic expedition of 1907 to 1909. 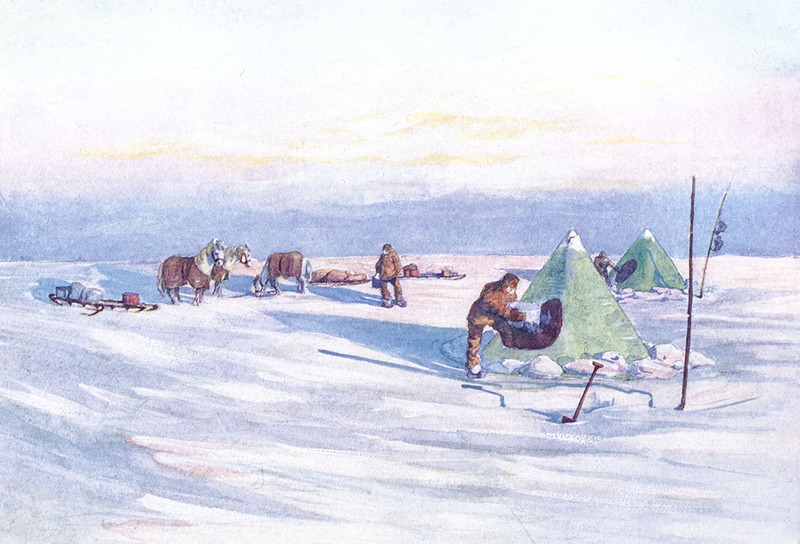 Shackleton and his men made it to within 97 miles of the South Pole, experiencing along the way every hardship possible, then returning to their wooden ship before the ice crushed it. 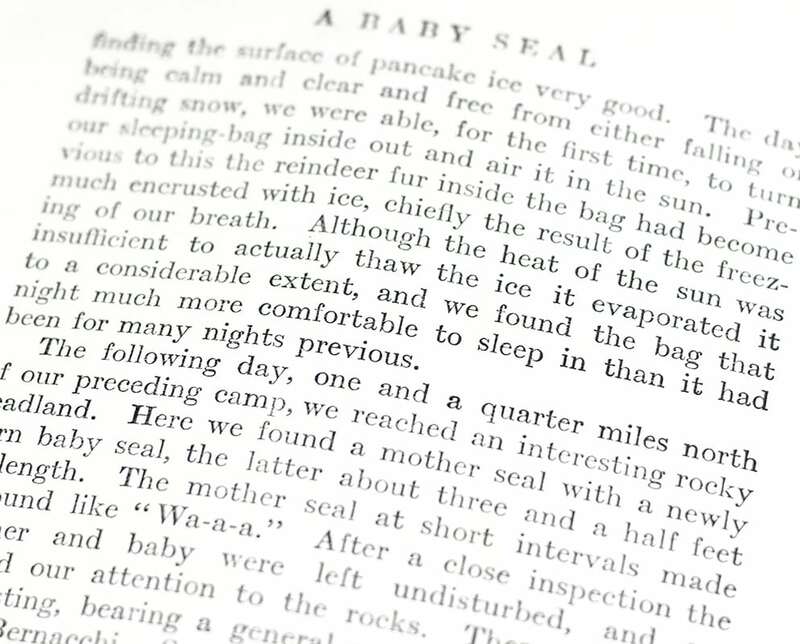 "A more interesting book of polar exploration . . . has yet to be written" (New York Times Book Review). Shackleton, Ernest Henry. Frank Wild, Alexander Macklin, Leonard Hussey, Frank Worsely, Douglas George Geoffrey, James Dell, L. R. Rickinson, Harold Watts, John Charles Bee-Mason. Rare autograph note signed by each of the primary members of the Shackleton–Rowett Expedition, including: Ernest Henry Shackleton, Frank Wild, Alexander Macklin, Leonard Hussey, Frank Worsely, Douglas George Geoffrey, James Dell, L. R. Rickinson, Harold Watts, John Charles Bee-Mason. The note measures 7.25 inches by 6.25 inches. Double matted and framed. Exceptionally rare. 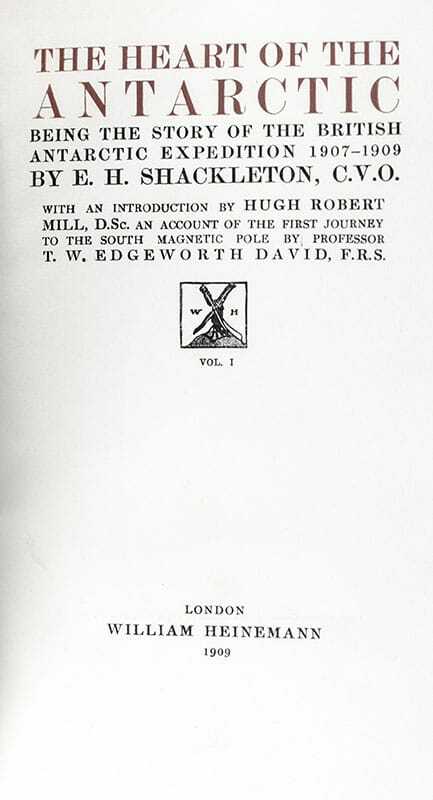 Rare first edition, Special Limited Large Paper Issue of Shackleton’s account of the British Antarctic Expedition of 1907-1909, number 97 of only 300 copies printed. Quarto, bound in full (Heart of the Antarctic) and half (Antarctic Book) vellum, top edges gilt. First and only edition of The Antarctic Book, with the signatures of every member of the party, including Ernest Shackleton. Additionally inscribed by Shackleton in volume one on the front free endpaper, “To Sir Edward Goschen with kindest regards from the author E.H. Shackleton Berlin 1911.” The recipient Sir Edward Goschen, 1st Baronet was a British diplomat, who served as an ambassador to Belgrade, Copenhagen, Belgrade, Vienna and Berlin. With 16 mounted color plates, photographic frontispieces and over 200 additional illustrations including drawings and photographic plates. Three folding maps and a folding panorama enclosed in the rear pocket of Volume II. 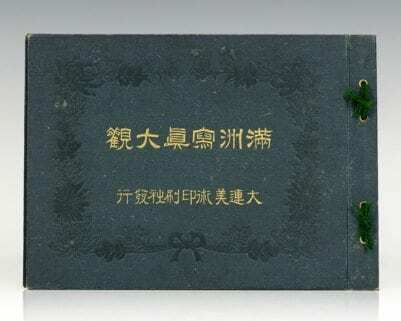 The Antarctic Book, which includes the 16 signatures of the shore party, was issued only with this Limited Edition of The Heart of the Antarctic and has never been reprinted. 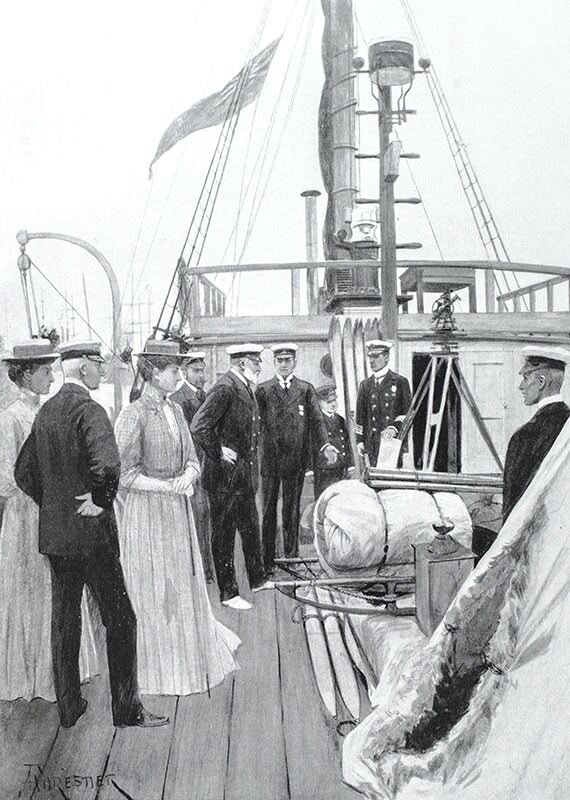 It contains reproductions of drawings done by the party, including four mounted color portraits, the poem “Erebus” by Shackleton and the whimsical story “Bathybia” by Douglas Mawson, also a member of the party. From the Adventure and Exploration collection of James Stephen “Steve” Fossett with his bookplate to the pastedown of each volume. American businessman and record-setting aviator Steve Fossett became the first person to fly solo nonstop around the world in 2002 in his 10-story high balloon Spirit of Freedom. He completed the 2002 trip in 13 days, 8 hours, and 33 minutes and set records for both the Longest Distance Flown Solo in a Balloon and Fastest Balloon Flight Around the World. Fossett was also one of sailing’s most prolific distance record holders set the Absolute World Speed Record for airships with a Zeppelin NT in 2004. He received numerous awards and honors throughout his career including aviation’s highest award, the Gold Medal of the Fédération Aéronautique Internationale (FAI), which he was awarded in 2002. Fossett disappeared on September 3, 2007 while flying a light aircraft over the Great Basin Desert, between Nevada and California. In fine condition with a touch of wear. 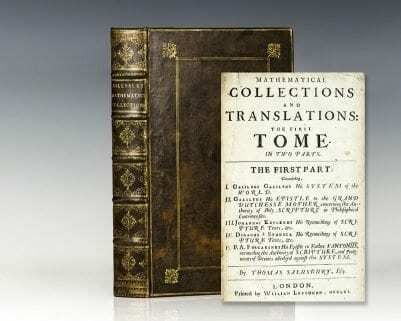 A superior example, rare and desirable signed twice by Shackleton. Philadelphia: J. P. Lippincott Company, 1909. First editions of Shackleton’s fascinating account of the British Antarctic Expedition of 1907-1909. Large octavos, 2 volumes, original blue cloth. Near fine in the rare original dust jackets with light wear and a few unnecessary tape repairs. Contains three partly colored folding maps & 2 panoramas on 1 folding sheet in rear pocket, 2 photogravure frontispieces and 12 color plates. 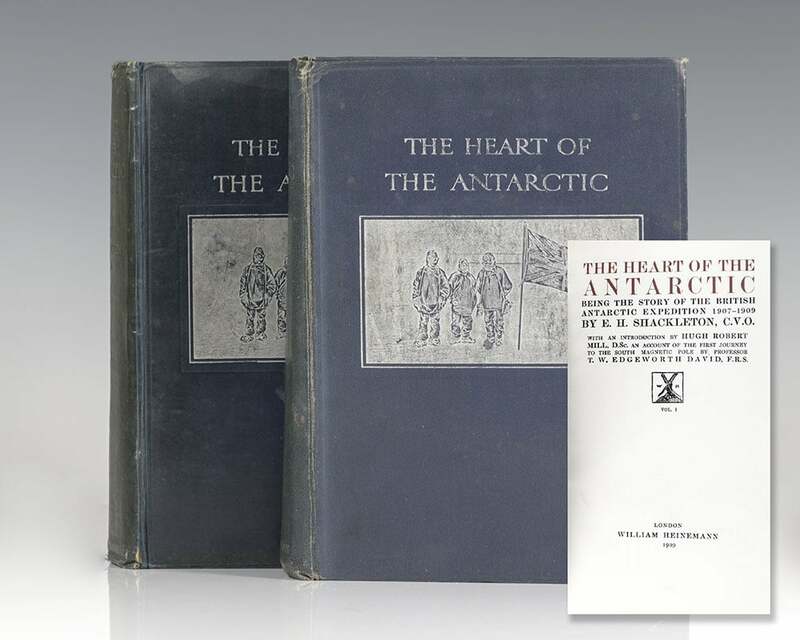 Examples of Heart of the Antarctic in jacket are rare, with only one example of the American edition dust jackets appearing at auction in the last 50 years.